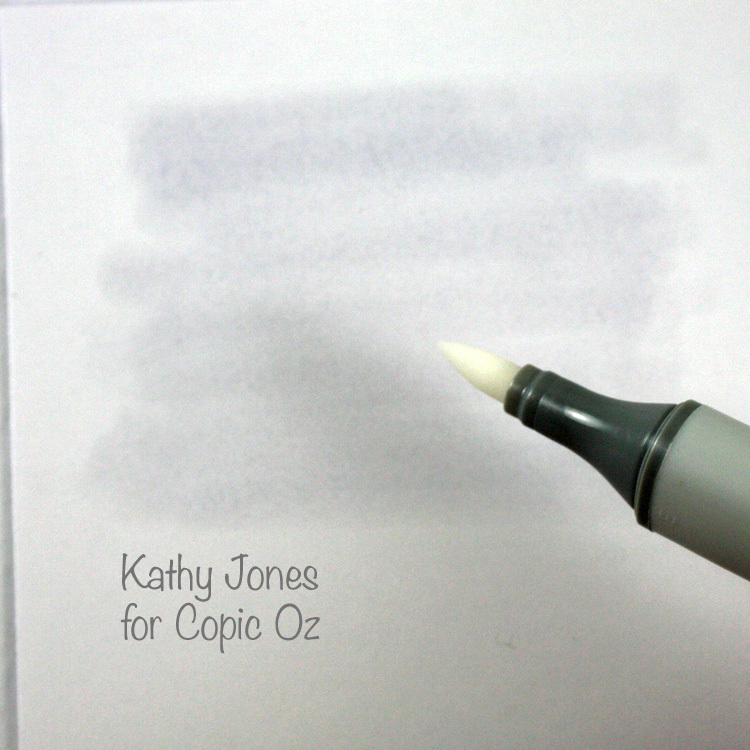 I'm so excited to share my first post for Copic Oz with you all, my tutorial this week is on creating Copic Backgrounds. 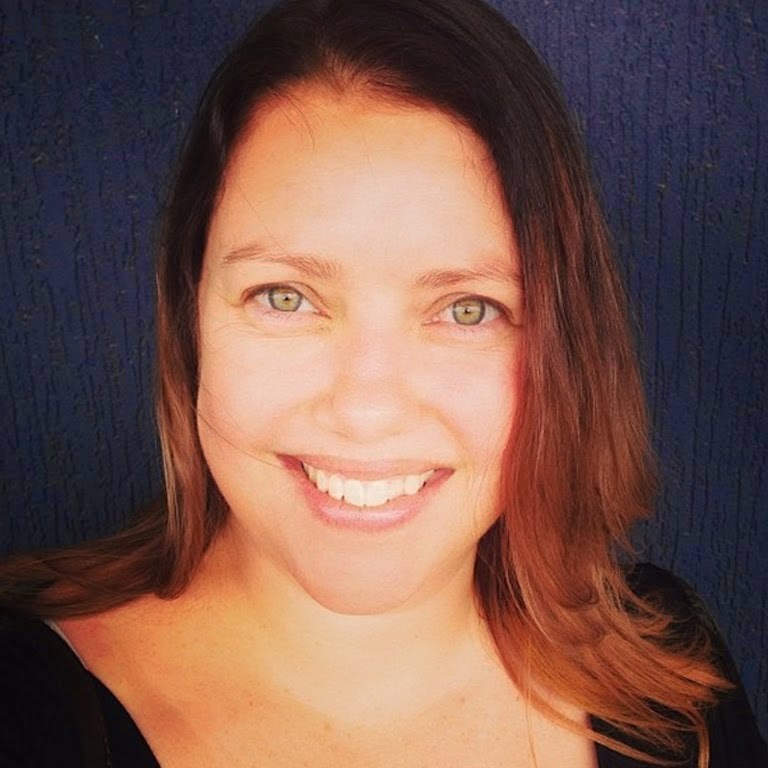 Now any of you who already know me from my blog, know I LOVE backgrounds, I love making them, I love using them, I just love everything about them, so this topic was perfect for me. My biggest problem was narrowing down what to show you all, there are just so many options, I decided to stick to backgrounds that use the Colorless Blending Fluid in some way - I hope you enjoy these and don't forget we would love to see how you use our ideas, so leave a link to your blog post in the comments section if you have used this technique on something you have created. 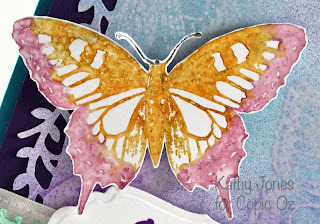 For this technique you will need several colours of Various Ink, Colorless Blending Fluid, a mini mister, a non-stick craft sheet or waxed baking paper and glossy or coated cardstock. Drip about 5 drops of each colour (I used V28, V06, V17) onto the craft sheet, making sure the droplets no not touch. Add a little of the Colorless Blending Fluid to a mini mister, and spritz ink on craft sheet - this is very important, if you forget to spritz you will end up with 'spots' of intense colour. Spritzing ensures the colours move and blend a little. Make sure you only spritz a little, add too much and your colours will be very pale. As a rough guide - I used 4-5 pumps of the mini mister nozzle. Place card glossy side down, onto the ink drops, then press down gently with fingers to make sure you have contact. I like to then drag the card through the ink to pick up the colour. Turn card over to check the coverage you have achieved, you may like to leave the white areas, I prefer to keep swiping the card through the remaining ink until most of the white is covered. When your card looks something like this you are ready for the final step. 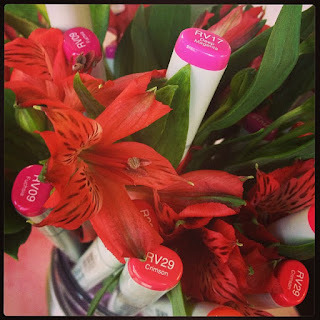 Spritz some of the Colorless Blending Fluid onto the tips of your fingers. Then 'flick' the blending fluid onto your card, the more fluid on your fingers the larger the droplets, for finer droplets either flick with more force or use less blending fluid. I like to have a mix of large and fine droplets. Wait about 1 minute for the pattern to fully develop before deciding if you want to add any more blending fluid. I consider my background complete when it looks a bit like this. 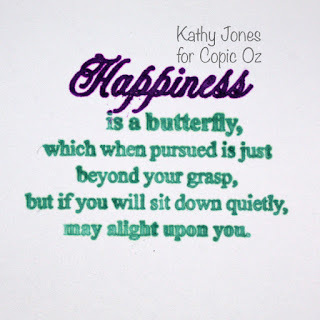 You could die cut this to use on a project, use it as a layer or even stamp directly onto this using an oil based ink pad like Archival ink, to create a simple but stunning card. 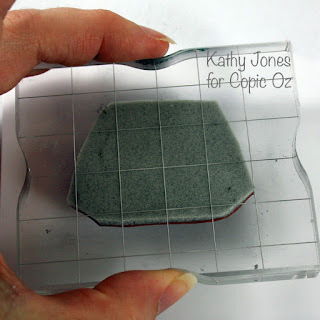 This technique can also be used on clear acetate for fabulous results and looks simply beautiful when used as an accent panel. Now, my next background is fun - heaps of fun and there are so many ways you can adapt this idea, though you will need a Copic Airbrush. I currently use the X-Press It Air Compressor Auto - which I adore, though this technique will also work with any of the Copic Airbrush kits. 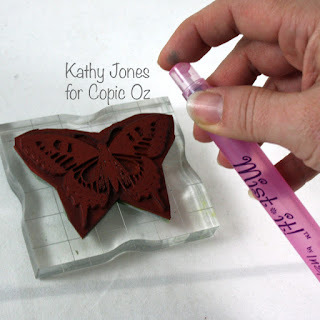 For this technique you will need several colours of Copic Marker, Colorless Blending Fluid, a mini misting bottle, a Copic Airbrush, a stencil or template and X-Press It Blending Card. Start by airbrushing your palest colour (which in this case was YR09) onto the blending card - don't cover the card, just add colour in patches like I have. Then add your deepest colour (R37) with the air brush, overlapping the colours a little - you should still have some white areas at this point. 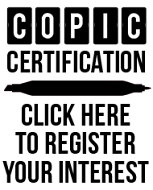 Next add an intermediate tone (R17) again overlapping colours, this helps any visible lines or edges disappear. You should still have a little white. Finally add a bright, strong colour (RV09) filling in all remaining white areas and use this same colour to blend any lines, patches or edges between the other colours. I know this is bright, but you will find that the brights and dark colours work best for this technique. Fill a mini mister with Colorless Blending Fluid and tape a stencil over your background, make sure your stencil or mask will not move about during this next step. Carefully spritz the airbrushed card with the blending fluid - very lightly. You can always go back and add more later, but if the liquid seeps underneath the stencil then your design will be ruined. Lightly spritz, then wait for a minute to see if more blending fluid is needed, if it is, lightly spritz again. Very rarely, will you need to spritz a piece more than twice. No need to wait, you can carefully remove your template from the card right now - and you will have a wonderful background with a pattern or design all in coordinating colours. I'm hoping you have as much fun making these backgrounds as I did and that you have enjoyed my first post for Copic Oz. Happy Valentines day from the team at Copic Oz! Did you get any special surprises?! Our friends over at X-Press It have a giveaway on their facebook page! 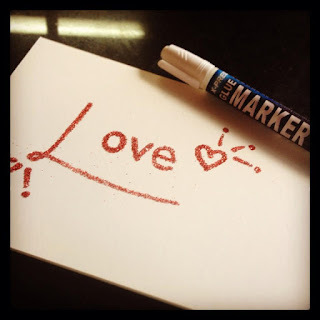 They are giving away 100 X-Press It Glue Markers. Head over to the X-Press It facebook page, like them, share the post with the same photo as above and leave them a comment telling them about what you love about The X-Press It range. 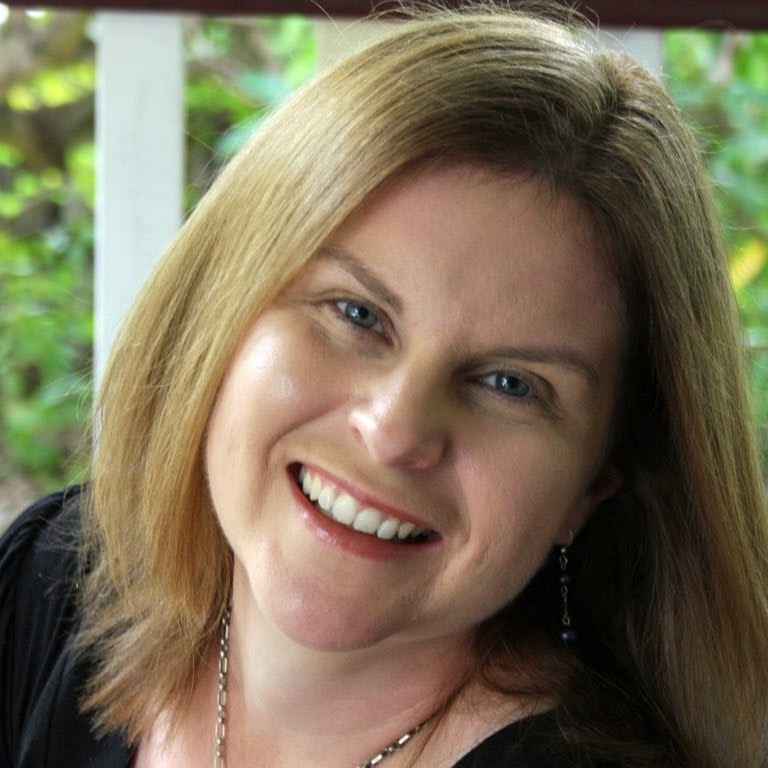 You have until 11:59 pm AEST on Sunday Feb 17- Sorry, Australian Residents only- one Glue Marker per household. Hello Everyone and welcome back to another Copic Oz Tutorial! Today I'm going to be talking about stamping with Copic. Many people think that Copics are for colouring images - which is true, but you can achieve other effects by using them direct to rubber! 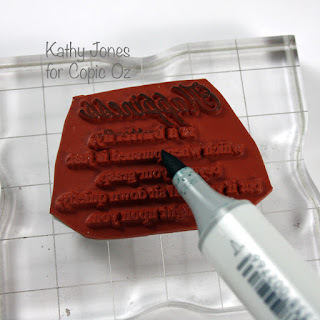 Please note that I do say Rubber.....not clear or acrylic stamps - these techniques don't work with clear stamps! Some people think that you can't do direct to rubber with Copics, but that isn't true!! You just need to know how to use Copics which are alcohol based compared to the waterbased markers which people are more familiar with using on these techniques. I've taken a BG18 Copic Sketch Marker and applied the ink direct to the rubber sentiment. The ink WILL dry on the stamp.....this is normal! 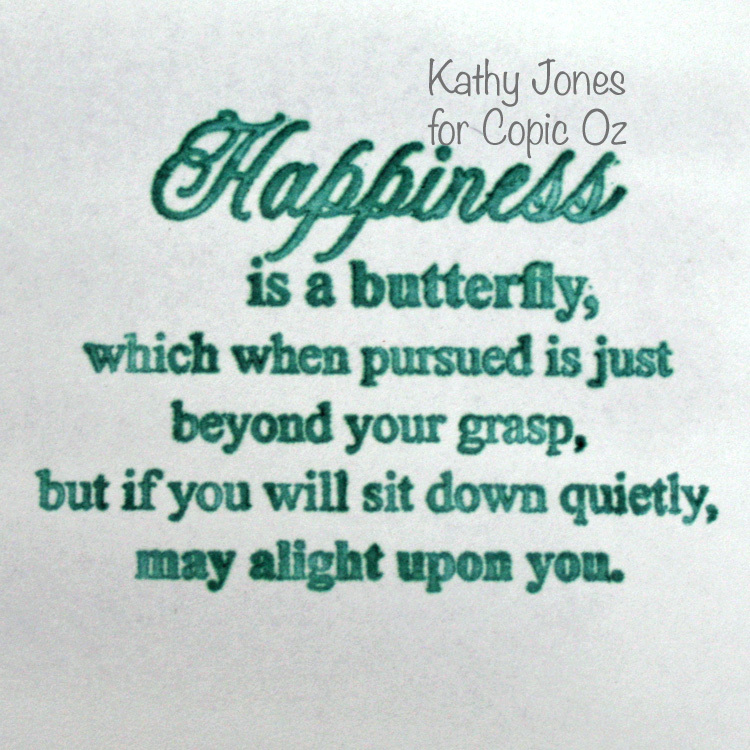 :) This sentiment stamp is from Butterfly Dreams by JustRite Papercraft. Water based markers need to you 'huff' on them to reactivate the ink, this obviously won't work with Copics because they are alcohol based. To 'reactivate' the ink on the stamp you need alcohol, so take your Colourless Blender (0) Marker and dampen an area of X-press It Blending Card big enough to stamp your sentiment on. Stamp your sentiment onto the area dampened with the Colourless Blender! You can follow the same procedure to make dual coloured sentiments (or use as many colours as you like)!! 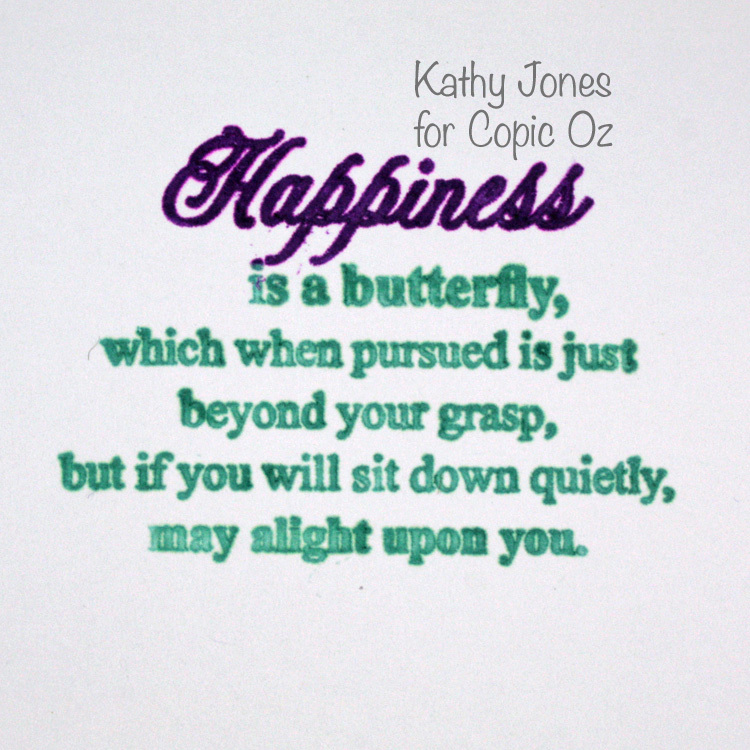 This time I've coloured the word 'Happiness' in V09 and the rest of the sentiment with BG18. Then once again I've dampened some X-press It Blending Card with the Colourless Blender and stamped the sentiment over the top! 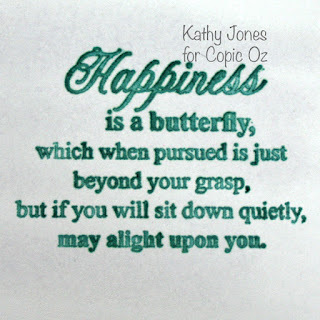 The beauty of this technique is you can always make your sentiment the perfect colour match for any project you are making! There is another way of using the direct to rubber technique! This time I've taken the butterfly image stamp from the same stamp set and coloured it with R85, Y38 and N7. Of course, like the sentiment, the ink has dried on the stamp however instead of dampening the card, I've used a Mist It filled with Colourless Blender Refill Ink to spritz it. Stamp the spritzed image onto blending card. This will give you a softer effect much like a watercolour painting instead of the crisp look of the previous technique. For a bit of fun I've also created the background for my card with a Copic Resist style technique! 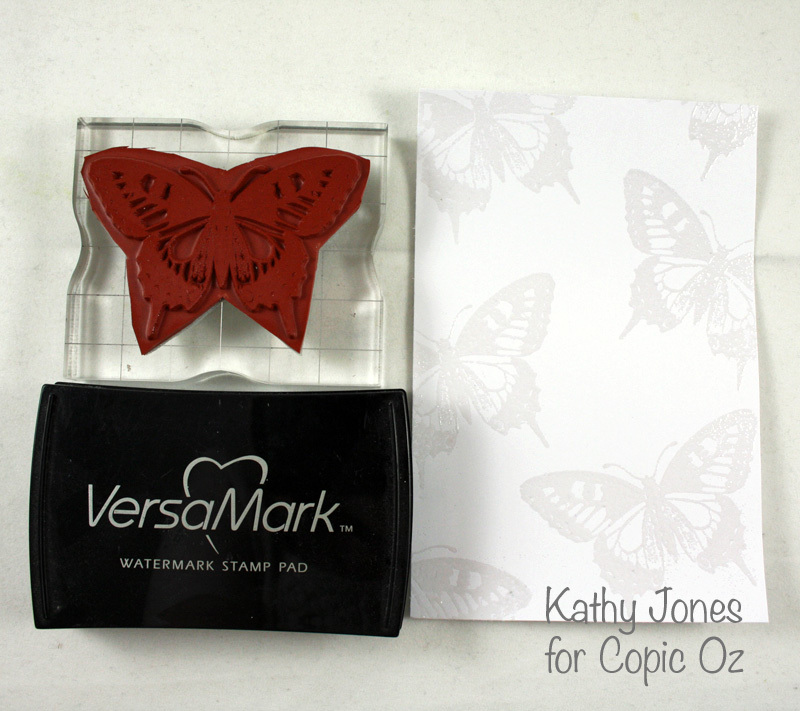 Stamp the butterfly in VersaMark ink over a piece of white X-press It Blending Card and heat emboss with Clear Embossing Powder. Let this cool before the next step. 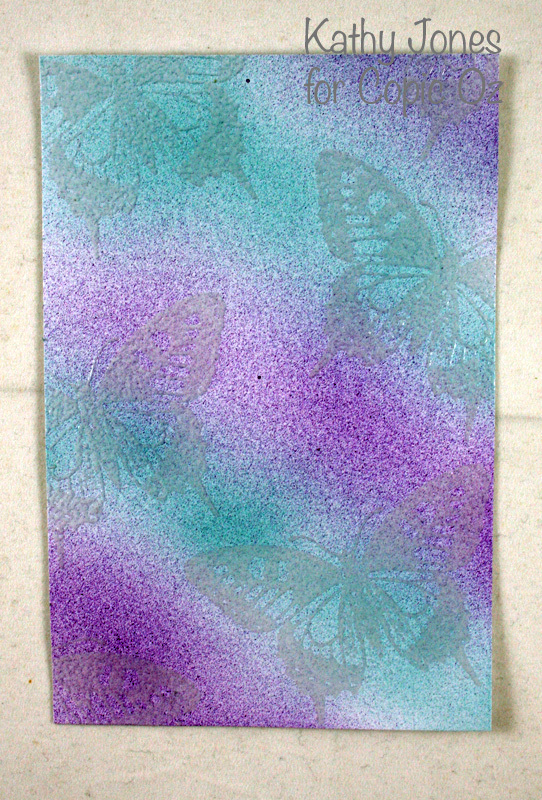 I've used V09 and BG18 and an airbrush system to airbrush over the butterfly card. Buff the excess ink off the embossed parts. If it's a little stubborn, spritz a little Colourless Blender Refill Ink onto a baby wipe (not too much!!) and you'll see the white card show through the clear embossing powder. Have some fun creating your own background and using your Copics for Direct to Rubber technique and leave a comment here so we can see what you've made! We'd love to see what you create!